Starting March 30, 2010 selling on eBay will be a better deal than ever! List Auction-style FREE--no Insertion Fees--when you start your Auction-style listing under $1. Get new, lower Insertion Fees for all other start prices. Either way, pay one easy Final Value Fee of 9% of the winning bid (but never more than $50)-and pay only if your item sells. List in Fixed Price for 50¢, with Final Value Fees for the most part staying the same. Today, I learned that eBay store owners get a very different "deal" that adds significant monthly overhead. This change essentially kills the ability for some card sellers to make any kind of money. Read the White Sox Cards post on The Final Straw of an eBay Seller, excerpt below. "Why would a company founded on the consumer getting the best deal, shoot itself in the foot at almost every opportunity in the past two years? I haven't been able to offer the best deal on some items for two years. Now, I can't even afford to keep the good fight going." One angle is that eBay's trying to convert low-margin shops to "active" sellers, where ongoing 99-cent listings allow them to cull more frequent transaction fees. Another take's that they're trying to "clean up" shops that carry over-priced (and thus, under-selling) inventories, by upping the monthly overhead. 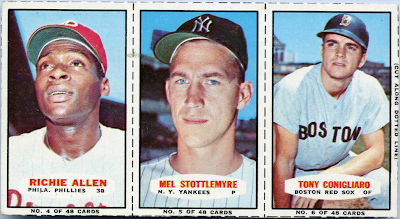 (I'm thinking of hi-grade slabbed cards from the 1970s for $500.) The impact's not specific to sport cards, of course, yet this seems to impact us more than, say, iPod sellers. Will this new policy change how you use eBay as a seller (or buyer)? 1920 Baraja Cine Manual #5, Jugadores de "Basse-Ball"
A friend traded this curious #5 to me in 2004, without any supporting set info. It's slightly longer than a typical baseball card and uses thin, flexible stock. 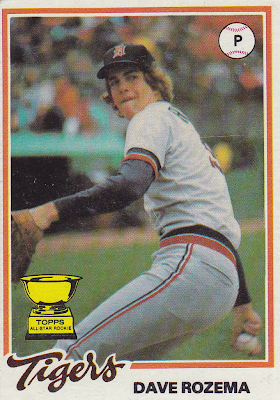 Five trophy-like cups match the numbering and surround 3 batters, not unlike a tarot card's composition. 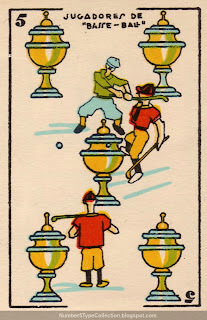 (The players appear to be competing for the ball, similar to field hockey or polo.) Its title translates to "Base-ball players." I found a handful of complete sets for sale online, so assume Baraja sold them as one (boxed?) unit. The cartoon style and bright colors suggest kids or parents as the target audience and recognizable characters include Charlie Chaplin, Harold Lloyd, and other athletes and performers from the 1920s. 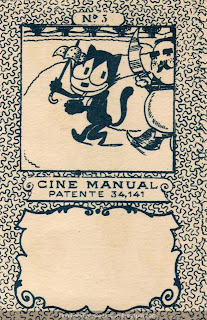 Each card back includes a number, Felix the Cat-like cartoon picture, and "CINE MANUAL" title, which translates to "HAND MOVIE." Unlike the suited fronts, back numbers go from 1 to 48. If you stack them all in numerical order, the pictures animate like a flip book. It's a very interesting addition to an already colorful set--and apparently the company gained a patente on the concept. Searching for info on Baraja Cine Manual uncovered a PowerPoint presentation that profiles several sets produced outside the USA. Each slide profiles a set by scan and description, though non-Spanish speakers might need Google Translate to read them. 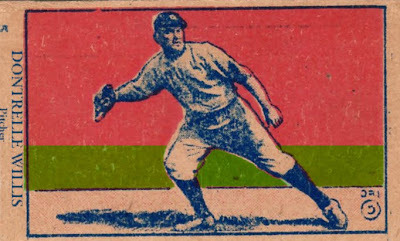 Find the slides at CROMOS DE BÉISBOL. Value: I found about a half-dozen foreign listings asking from 25 to 70 Euros for the set. Singles and mixed lots are probably out there, though not easy to locate. 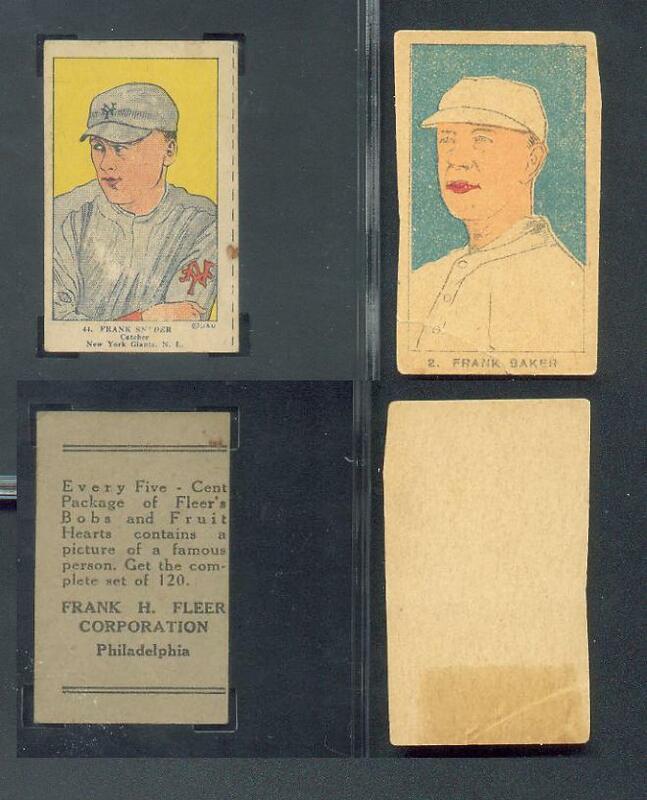 Fakes / Reprints: No idea if anyone's faked this set, though it'd be pretty easy with modern tools. 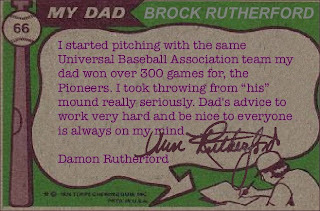 While Damon's a primary character, the book also highlights his (former great) father Brock, so I felt inspired to do a 1976 Topps "Father & Son"-style card. More voters from last week favored teams and decades over card value and best-of. I'll take that angle when updating blog labels in the near future. How far can an American travel to see some baseball? Back in 1979, a Boston resident could circumnavigate a fifth of the globe, 5087 miles total, and see the Hawaii Islanders play AAA ball at Honolulu's Aloha Stadium. If you do, be like Mr. Dyes and bring your beach towel. The Islanders baseball team is mentioned on a number of occasions in the 80's television series of "Magnum PI". The main character played by Tom Selleck was a baseball fan for the Islanders and often he wore a Detroit Tigers ball cap. 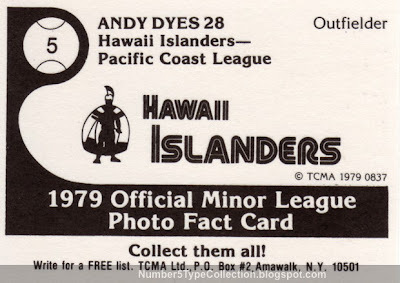 TCMA left Andy's 1978 stats off his card, possibly because he split time between 3 organizations--Seattle, Toronto, and the aforementioned San Diego. (Full stats at Baseball-Reference.com.) It proved his best professional season; Andy retired after two more years in Honolulu, something we can all aspire to doing. 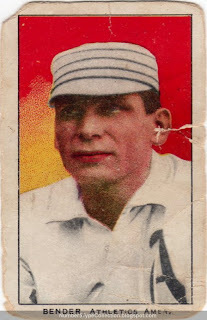 Value: I bought this #5 on eBay for $1, about what you'd expect to pay for minor league singles. Fakes / Reprints: People have probably reprinted valuable minor league league cards of big MLB stars, but I don't know of any for commons. Between 1976 and 1981, the Yankees won 100+ games 3 times, the AL East 4 times, and the World Series twice. 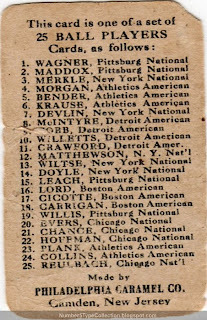 Most accuse them of buying players and titles, yet their AAA farm team also excelled, providing a steady stream of surrounding talent for their free agent acquisitions. 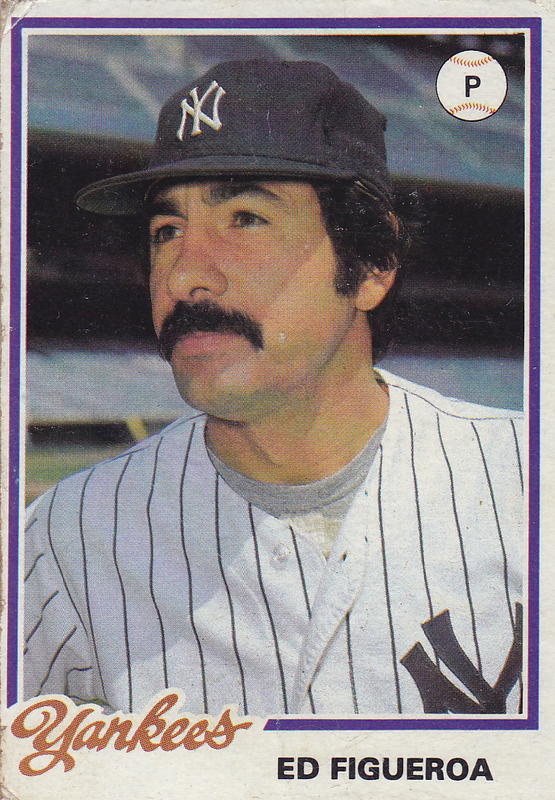 In 1978, Yankee farmhand Garry had his finest season. 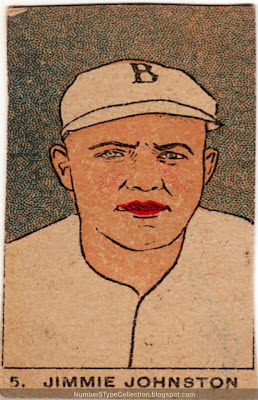 He played everyday (116 games), registered a .419 OBP, and set career highs in hits and RBI. (Full minor league stats.) For all the winning and periodic good play from Smith, the parent club never rewarded him with a call to the majors. It's likely a crowded New York outfield made it almost impossible to break through; Lou Piniella, Mickey Rivers, and Reggie Jackson manned those spots in 1979, with vets Oscar Gamble, Bobby Murcer, and Roy White backing them up. This blog's nearing 200 posts and it grew a weedy garden of "labels" (years, teams, leagues, etc.) along the way. At first, making lots of them seemed like good planning. Down the road, readers could see all the old Brooklyn cards with just one link! While technically true, it's also easy to search for "Brooklyn." Player names and card companies are also easy to find that way. I'm considering use a small list of more abstract labels like "best of," "minor leagues," or "war time." Some bloggers nominate specific entries as their favorites and they're usually good. Card rarity and valuable also makes an impression. We amass huge amounts of cardboard and like them for a bunch of different reasons, yet the first question non-collectors ask is, "what's your most expensive card?" This week's poll asks what, if any, blog labels you find useful. It'll be open through Sunday and thanks for votes and comments. In November 2009, Paul Lukas of Uni Watch let readers vote on the title of "WORST UNIFORM EVER." I was honored (?) to submit an eventual finalist, the 1980 Tucson Toros. Their toreador-homage--yellow, orange, red, different orange, avocado, and turquoise--no doubt pushed the boundaries of what you could pay players to wear. (Worst Uni Finalists and Voting Results.) 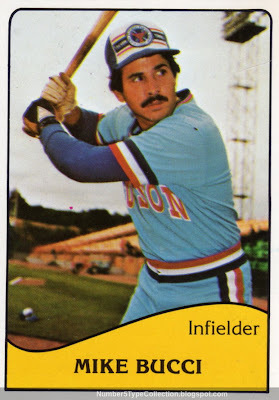 See that stunning design in my 1980 TCMA Tucson Toros set profile. 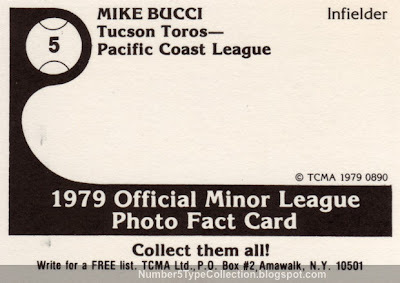 This card leaves off Mike Bucci's 1978 stats, a curious omission for an everyday player. 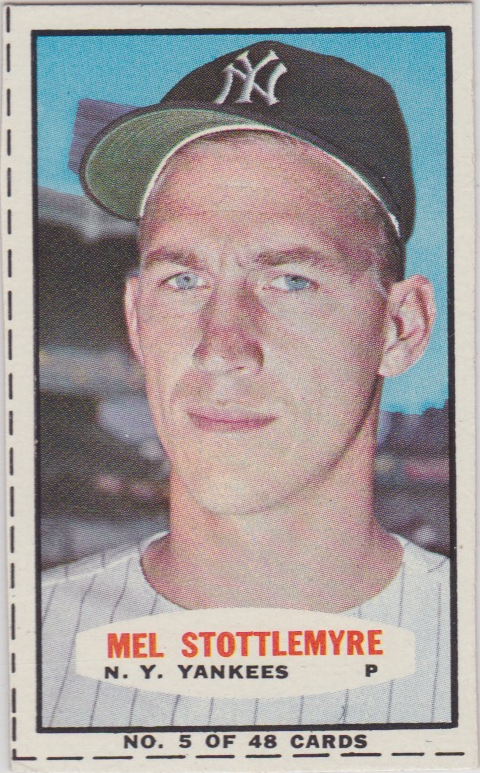 (For the record, he sported a nice .438 OBP in 115 games, full minor league stats at Baseball-Reference.) 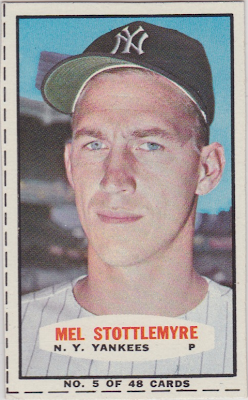 He also played as both third baseman and outfielder, not just in the infield. TCMA produced 50+ sets in 1979, so I expect lots of cards sport at least one typo or research error. 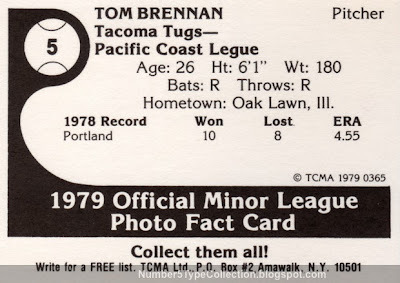 TCMA published an almost limitless number of minor league team sets during the 1970s and 1980s. 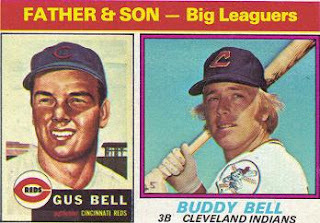 They ramped up slowly with a few midwestern teams in 1974, but grew to almost dominate the market by 1978. Future big-leaguer Brennan had no problem holding the pose you see, left leg cocked and held at the ready. In fact, he usually pitched with a significant pause at the leg-lift stage, similar to Hideo Nomo's full-stretch windup. (Check it out in Nomo vs. Ichiro, circa 1996.) Tom eventually released the ball sidearm, a complete delivery that no doubt puzzled opposing batters. 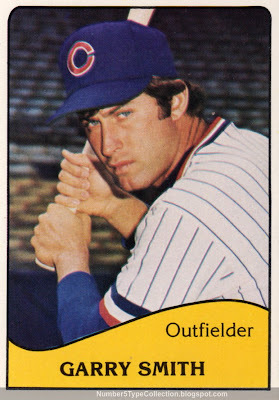 Tom spent a long time in baseball, with 12 seasons of minor league work sandwiched around a full year with the Indians in 1982 (full stats at Baseball-Reference.com). 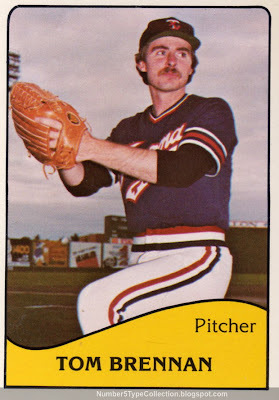 He played for 10 different Cleveland farm teams from 1974 to 1983, including two quality years with the Tacoma Tugs in 1979 and 1980, where he went 21-10 with 4 shut-outs. Value: My 2010 SCD lists the Tacoma Tugs set at $17.50 and I picked up this #5 for $1, about what you'd expect to pay for that era. 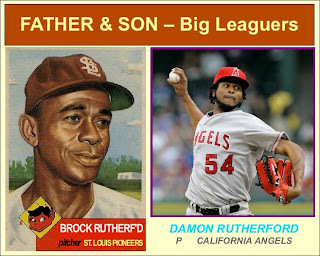 Fakes / Reprints: It's likely people have reprinted valuable minor league league cards of major stars, but I doubt it'd happen for lesser-known players. While most recently seen as pitching coach for Seattle, Mel's best-known for his time in pinstripes, averaging 16 wins across 11 seasons with a career 111 OPS+. He received MVP votes 4 times, placing as high as 10th in 1968. (Unfortunately for him, Denny McLain blew away the competition that year with 31 wins.) Also, for the ladies, ICY BLUE EYES! Value: You can buy Bazooka cards several different ways, with rapidly escalating prices. This clean-cut #5 cost about $10, on the high end of single commons. Full, uncut panels cost several times that and complete boxes run $100 or more. 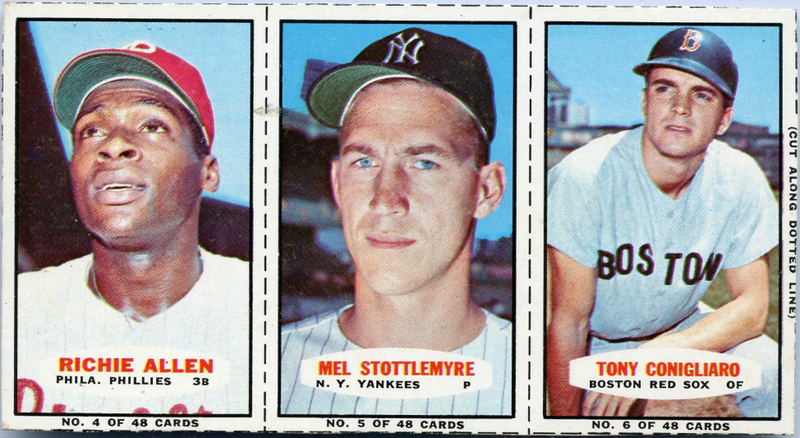 Burger King published 9 sets from 1977 to 1980, mostly team-specific collections like today's 1978 Yankees (full BK set list). 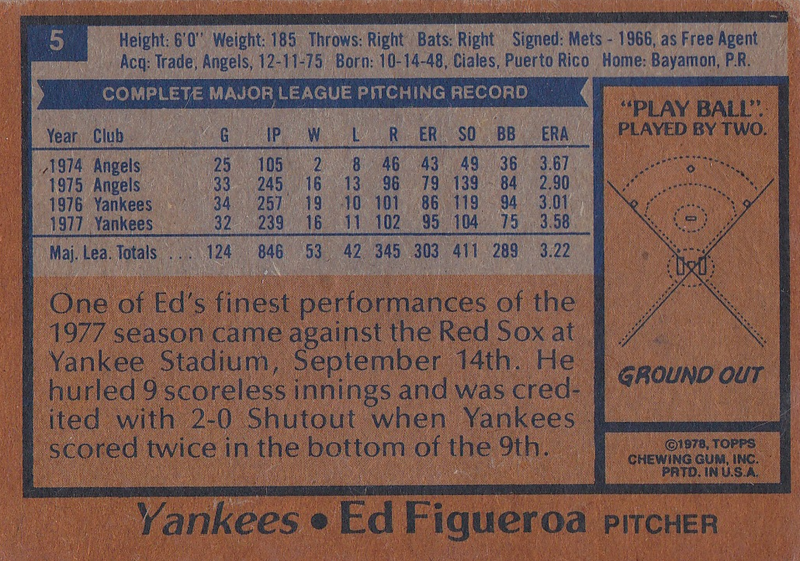 This one includes 22 players and an unnumbered checklist, featuring HOFs Catfish Hunter, Goose Gossage, and Reggie Jackson. Like other 1978 Burger King issues, only the checklist differs from the Topps design (PhillySportsCards.com has a nice gallery), so people often confuse the two sets. Card number (and pose variation, if any) distinguish them. 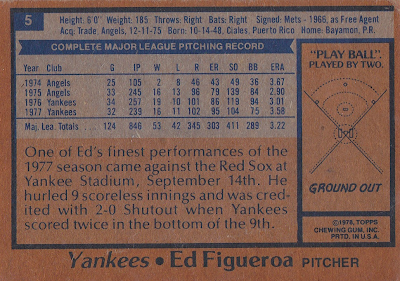 Ed Figueroa went 20-9 in 1978, becoming the first Puerto Rican pitcher to win 20 games. Arm injuries limited his effectiveness in 1979, "earning" a release by the Yankees. 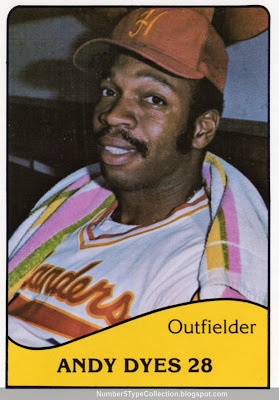 He finished with a year each in Texas and Oakland and retired in 1982. Fakes / Reprints: Burger King cards are available on eBay (and elsewhere online), so Yankee fans can probably get them. They're not valuable enough to be worth reprinting or faking. Two things caught my eye this morning. Totally Cecil featured Cecil Fielder's 1994 Topps Black Gold #5, with front and back scans. I sat over the dugout once at a Mariner game against the Tigers and can confirm that Cecil "pushes a ton of freight" from close up. I can only imagine the post-game buffet. Today's guest just missed 2010 HOF election, falling 5 votes short of the required 75% (full MLB.com story). Some writers have made his long-time excellence for (mostly) middling teams a fulcrum to critique the business of baseball and Cooperstown's own political history. 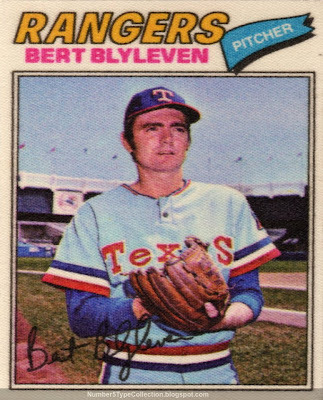 I just remember Bert as a worthy opponent for my Mariners, going 14-7 against them in 27 games pitched (career splits). 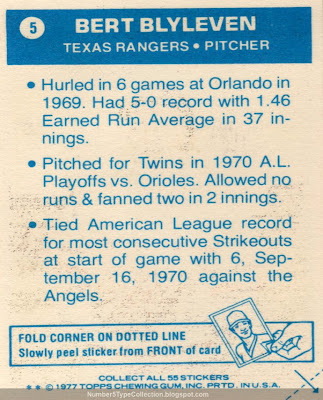 1977's the best known cloth sticker set, but Topps tried them first in 1972. Robert Edwards Auctions sold a pair of uncut 1972 sheets for $1K not long ago. Value: Ungraded sets go for up to $50 and singles cost a dollar or two. Nolan Ryan is the top star and could cost you $20. Fakes / Reprints: Haven't seen any fakery for this set, as it's too costly to replicate a sticker issue for just a few dollars. 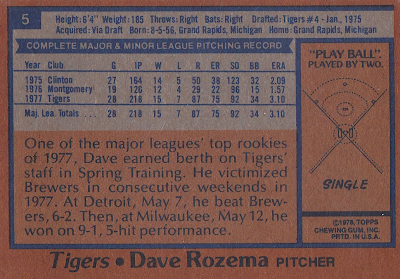 Another of Burger King's 70s / 80s card surge (full set list), this 23-card issue covers Detroit's improvement from 1977's tepid 74-88 record to 86-76 in 1978. Unfortunately, they actually dropped in the standings, as 4 AL East teams won at least 90 games in '78. This card's also important for folks who collect the Topps All-Star Rookie trophies (the Wikipedia profile lists them all). With one player per position, Eddie Murray (DH) and Andre Dawson (OF) were Rozema's best-known teammates (1977 ASR selections). 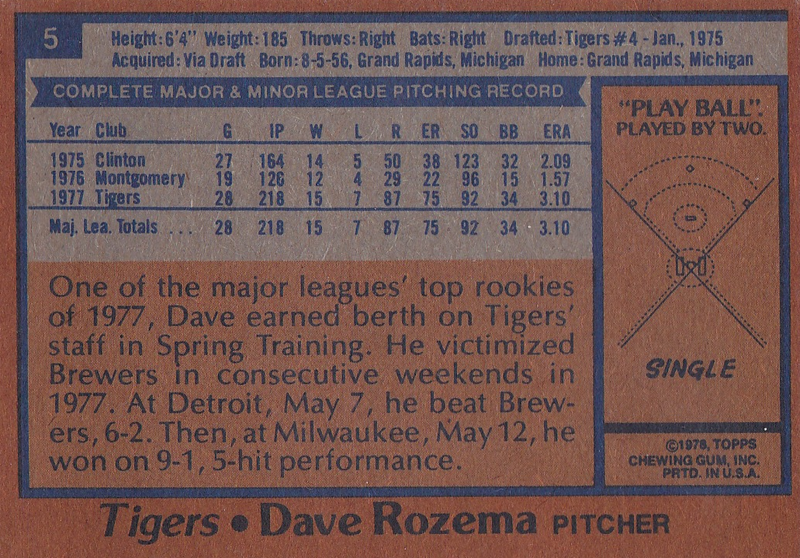 Dave tossed an excellent 15-7 rookie campaign, a win total it took another 3 years to match. Despite obvious pitching skills, a penchant for bizarre injury (karate kick bobblehead here) limited him to 10 seasons and a 60-53 record. Value: Complete sets go for $10-20, depending on condition. Jack Morris, Mark Fidrych, Lou Whitaker, and Alan Trammell are the stars. Fakes / Reprints: Burger King cards circulated in the Detroit area and show up on eBay, so Tiger fans can probably get them. I don't know of any reprints and they're probably not pricey enough to be worth doing. Vote in the new poll to let me know what you enjoy most in the type collection and I'll add more of those in the new year. UPDATE: and Whatever means I'll keep picking targets of opportunity!